Jackpot Giant is brought to you by Playtech and is a progressive jackpot slot game with 5 reels and 50 paylines. Playable from 50p to £4 a spin, you can play it across all devices including desktops (PC & laptop), mobiles and tablets. Set in the Stone Age, it has a caveman theme that can reward you with a life-changing jackpot. There are stacked symbols in the game with 2 of them available – when they appear, the symbols (the giant behind the volcano and the giant amongst the trees) will take up 2 spaces on the reel thus increasing your potential win amount. When it comes to bonus features, look out for the volcano symbol with the word ‘Bonus’ as these appear on the 1st and 5th reels. When they appear on those reels at the same time, you will activate the Giant Bonus feature. You are then taken to a screen showcasing 6 volcanos – pick 3 of them to win cash prizes. You can also reveal extra picks or win all options – the size of the wins, though, won’t be that high. There’s nothing to be worried about though as you can win a life-changing jackpot in the Giant Jackpot feature – if you get the wild symbol (the gold plaque with ‘Wild’ on it) on payline 1 (across all 5 reels), you will win the progressive jackpot. You can only win whilst playing at the £4 maximum bet though. If you’re playing at a lesser stake, you will win a cool 1,000 times your bet. I found Jackpot Giant to be a nicely balanced medium variance game – there’s not much in the way of bonus features to be honest but then again it’s all about the progressive jackpot. 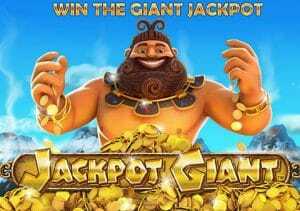 Graphically, Jackpot Giant is superb with brilliant cartoon graphics and animations. If you like progressive jackpot titles, Playtech also offer you Gladiator Jackpot which is based on the iconic film. Alternatively, I would recommend NetEnt’s Mega Fortune which, in total, has made more millionaires than any other online jackpot game.